Mr. 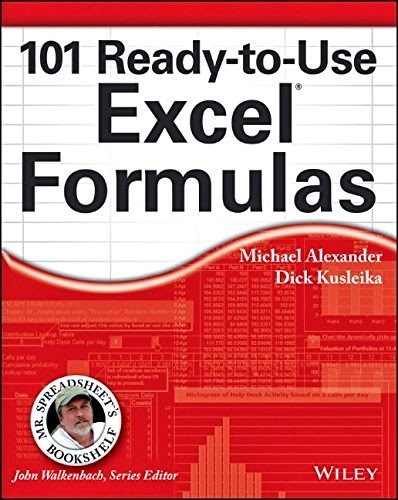 Spreadsheet has done it again with 101 easy-to-apply Excel formulas 101 Ready-to-Use Excel Formulas is filled with the most commonly-used, real-world Excel formulas that can be repurposed and put into action, saving you time and increasing your productivity. Each segment of this book outlines a common business or analysis problem that needs to be solved and provides the actual Excel formulas to solve the problem-along with detailed explanation of how the formulas work. Written in a user-friendly style that relies on a tips and tricks approach, the book details how to perform everyday Excel tasks with confidence. 101 Ready-to-Use Excel Formulas is sure to become your well-thumbed reference to solve your workplace problems. The recipes in the book are structured to first present the problem, then provide the formula solution, and finally show how it works so that it can be customized to fit your needs. The companion website to the book allows readers to easily test the formulas and provides visual confirmation of the concepts presented. Teaches you how to implement the required Excel formula Explains and details how the formulas work Lets you reuse or customize the given formula to address your particular needs Helps you make the formulas a regular part of your new, more efficient workflow Specific real-world scenarios are used to demonstrate how to most effectively apply Excel and its powerful formulas to complete tasks faster and with greater accuracy than ever before. Now you can save time, automate, and be more efficient and productive with 101 Ready-to-Use Excel Formulas.